Everything is a desktop local search engine which can find virtually any type of content residing on or accessible by a PC. 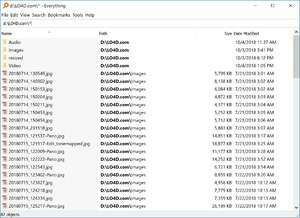 The programs works much like the built-in search engine on Windows but does the job of searching for files at a much faster pace. In fact, everything this program does is faster than Windows. The program originally indexes your computer and maintains that index so that files may be found at lightning speed. Version 1.4.1.992 is a freeware program which does not have restrictions and it's free so it doesn't cost anything. For security reasons, you should also check out the Everything download at LO4D.com which includes virus and malware tests. Additional screenshots of this application download may be available, too. Everything download been highly rated by our users.